Star Wars: The Force Awakens is a movie that brought together generations of characters as well as generations of film fanatics. 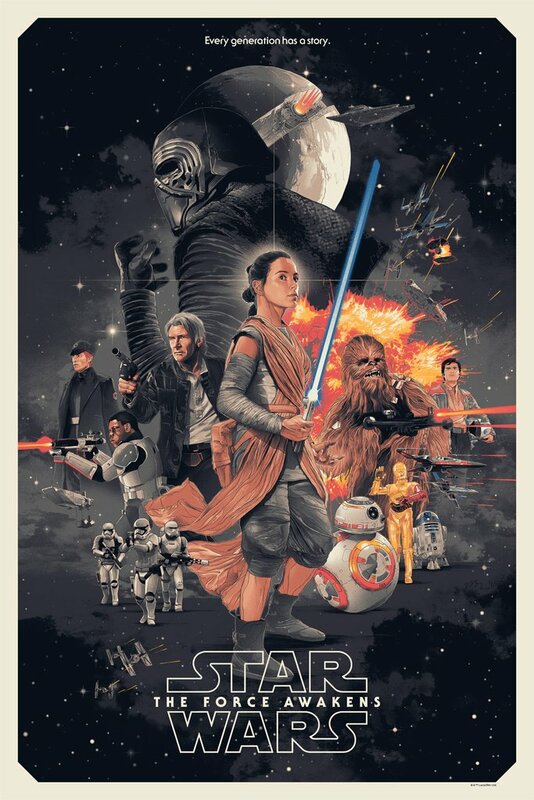 As one of the most long-standing, classic film franchises, Star Wars has always been about the relationships that its iconic characters share, and The Force Awakens introduced a brand new generation of fascinating characters and relationships, all battling it out for the fate of the galaxy. With that in mind, Bottleneck Gallery teamed up with Acme Archives and Grzegorz Domaradzki (Gabz) to tackle a companion piece to his phenomenal print for the original Star Wars trilogy that we released last year. Both the timed and variant editions of the print will go on sale today (4/6) @ 12PM ET. The timed edition will run through Sunday, April 9th @ 11:59pm est. and the gallery will announce the final edition size on Monday via social media. Both the timed and variant editions will be available today at 12pm eastern on our homepage, Bottleneck Gallery.